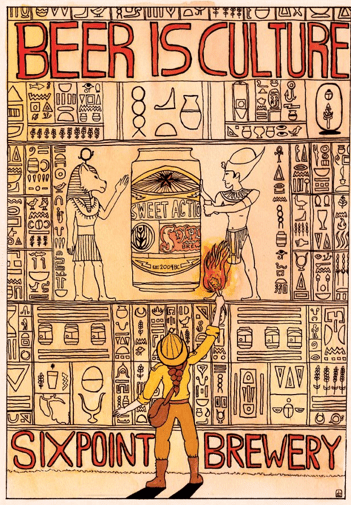 If you look closely at Danny Lewis’ entry for Beer Is Culture, you’ll find grains, goblets, and other pictographs related to beer. Taking a page from history, his Egyptian-themed illustration is definitely appropriate to the topic at hand. The Somerville, MA-based artist has “uncovered” many more subjects in his comic art and illustration, which can be viewed at his website. Read on for more about Danny’s work and great entry. DL: Well, the ancient Egyptians were one of the earliest civilizations to brew beer, and it had a hugely important role in their society – it even figures in to one of their creation myths, as a tool for stopping a rage-goddess that almost destroyed the world. So, it was good from the start! The history of beer has such wonderful stories within it, and I feel that the cultural aspect of beer and brewing is an important factor in the explosion of the craft beer world right now, and it’s one that reaches back thousands of years. The Indiana Jones-type explorer in my entry represents the modern beer drinker or brewer engaged in the active search for and celebration of the ties that beer culture creates. DL: I’m mostly self-taught, aside from a few art classes here and there. I had wanted to make comics since I was in high school, but it wasn’t until I was practically out of college that I started drawing in earnest. DL: To be honest, I really only use computers for the very last touch-ups on my work — I’m much more of a pen-and-ink kind of guy. Personally, I find that computers are a good support tool in editing my work, but I much prefer to work with physical media, myself. It is nice to know that if I drip ink all over a perfectly good piece, it’s possible to render it nicely in Photoshop without having to do the whole thing over again! DL: Lucy Knisley, Brandon Graham, Moebius and Joe Sacco are some of the comics artists whose work I love – they’re all incredibly different in style and substance, but they share a kind of lyricism in their comics that is simply inspiring. I’m also majorly in debt to the animations and sculptures of William Kentridge, Richard Feynman’s memoirs, and the plays of Sarah Ruhl, particularly Eurydice. DL: Culture isn’t something that springs into life fully-formed – it takes hard work, love, and dedication to something long before it becomes a part of culture. “Beer is Culture” reminds me to take a moment before I drink my beer to think about how it arrived at my glass, and to appreciate the care that went into it. Cheers!